As a salon customer, your satisfaction depends on your ability to successfully achieve your salon look at home. 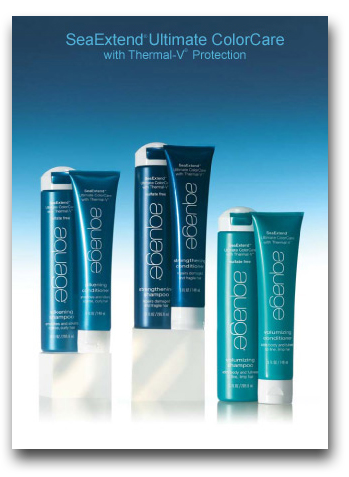 Our stylists have been specially trained to use and recommend Aquage. We will share special styling techniques and tips for using Aquage products that will help ensure your satisfaction. Aquage haircare and styling innovations are formulated combining the highest quality, professional grade ingredients with today’s most advanced haircare technology. The healing benefits of sea botanicals in each Aquage product nurture, hydrate, strengthen and protect your hair … beautifully. Aquage has rediefined color care with the gentlest, most luxurious shampoos and conditioners ever created. The new SeaExtend ColorCare dramatically extends the life and vibrancy of hair color results, restores hair to its ultimate condition and protects against thermal styling damage. Discover the best of sea and science. For the ultimate beauty experience, make an appointment to see how great these products truly are!